Our mission: To help unite and equip the Body of Christ with food, resources, and training necessary to transform our communities and the lives of those in poverty and need through the love and saving grace of Jesus Christ. << This is our first Post! Attached is the photo taken today with Kristen Mathis from the Fusion Class at Oak Hills Church. 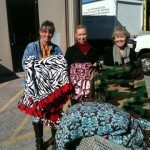 Kristen delivered these handmade blankets plus more that were donated and purchased. The Fusion class did a blanket drive for HCDBM and Kristen and some of the group had a blanket making party one night to make these gems. More information about this class is below…it was taken from their website. The Fusion Single Adults Ministry exists to be a community of Christ followers who fellowship with one another, welcome newcomers into Christian family, serve the community, and bring the Word of God to the world, while becoming deeper disciples of Christ through devoted study of the Bible.